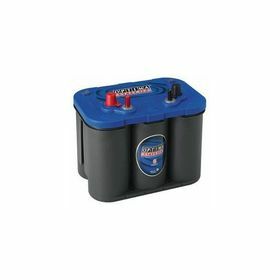 Optima BLUE TOP SLIM 4.2 8006-252 8006252 AGM Battery 12V 50AH 815CCA from County Battery Services. Free next day delivery on all Car Batteries. Click & Collect is only available at our Kirkby-in-Ashfield store. All products on our website are available for our Click & Collect service (subject to stock). · Choose your desired product on the website and process it online. You must pay for the item/s through the website. · Select Click & Collect in the ‘delivery’ section. · Wait for your ‘Ready to collect’ email. 1. We tend to leave an average of 2 hours between the time of the sale to the time at which your order will be ready to collect. Please note this may differ for specific orders. 2. If you order by 2.00pm on any weekday (Monday-Friday) your order will be available for same day collection. 3. For Saturday collection, you must have ordered before 3.00pm on Friday. Please bring a copy of your confirmation email when you collect your order. We will hold any products in store for a maximum of 14 days. Orders not picked up within 14 days will be returned and you will be refunded automatically. Prices and availability may vary in store, so to make sure you get the desired product for the desired price, please purchase through the website. County Battery Services shows you how to choose the correct leisure battery using the information from your appliances. We get asked the same question by a lot of customers, 'which leisure battery do i need? ', this will show you a quick way to find that information. The Optima BLUE TOP SLI 4.2 8006-252 8006252 Battery is a high-performance AGM battery with exceptional running time and more recharges than you’d get out of a traditional battery. On top of providing outstanding vibration resistance, the BLUETOP’s efficient power delivery and faster recharge time mean you’ll spend less time worrying about your battery. This means more time for fun. Again and again. This flexible boat battery and RV battery is ideal for those who need a sure-starting, strong-cranking, maintenance-free power source. As winter comes around it becomes more important to take care of your battery, whether it’s for a golf trolley, a motorbike or a caravan, if it’s not being used it needs to maintained. Here are a few tips on how to care for your battery over winter. It is imperative you disconnect your battery over winter. Batteries should always be disconnected if they’re sitting unused for an extensive amount of time. Some things still draw some power when they aren’t being used, meaning the battery could potentially run out of charge faster if connected. County Battery recommend storing batteries somewhere where the temperature does not fall below freezing. Unused batteries will deteriorate much faster than a battery that is in constant use or constantly being recharged. Batteries begin to self discharge when it is not being used and the chemicals inside start to react. Topping up the charge periodically will vastly improve its life. Be sure the charger used is correct for your battery. Lead Acid and Gel etc all require different types of charger. Be sure to monitor your battery when it is on charge, especially if your charger is not automatic as the battery may overheat/overcharge. If the battery is overcharged the acid/water will begin to boil and evaporate. Once you have removed a battery from the vehicle, before charging it is a good idea to clean the batteries down to rid them of any corrosion. A mixture of clean water and baking soda can be used to neutralise any acid on the case and remove any corrosion that may have developed on the terminals. How to create a magnetic motor with a battery! County Battery Expert Richard Fuller shows you how to make a magnetic motor with some wire, a magnet and a battery! You watch a poor soul sigh in exasperation as they try to turn the key in the ignition of their car. That dreaded whining noise sounds and the ignition light fails to light up on the dashboard. They try again. And again. But it’s no use - their battery is flat. Poor weather conditions can spell disaster for your car battery. Lucky for you, you can easily avoid falling into the same trap as that poor soul. Here are our top tips for maintaining your car battery in bad weather!